LA CROSSE, WIS. (VCSU) – Valley City State pitchers allowed just nine total hits and one run Monday afternoon as the Vikings completed a series sweep against Viterbo University. Nicholas Vargas and Christian Peery combined to allow just four hits and a run in game one of Monday’s doubleheader as VCSU won 4-1. In game two, Jesse Johnson and Brady Engebretson struck out 16 batters in a combined shutout and the Vikings won 1-0 in extra innings. VCSU’s offense was quiet, but two big home runs gave the team enough offense for the pair of wins. Sal Avila hit a 3-run home run in game one. In a scoreless game two, Grant Wehseler led off the top of the ninth inning with a solo home run, scoring the only run in the 1-0 victory. Monday’s doubleheader sweep completed a four-game series sweep of Viterbo, following up 5-0 and 8-6 wins on Sunday. VCSU pitchers struck out 49 batters in the series and combined for two shutouts. The 16 combined strikeouts by Johnson and Engebretson in the series finale is the most strikeouts by any NSAA team so far this season. Valley City State is now 13-14 overall and 8-4 in the North Star Athletic Association. The Vikings are currently third in the NSAA standings behind Bellevue University (13-1) and Waldorf University (13-1). Viterbo drops to 7-24 overall and 2-12 in the NSAA. Up next: Valley City State is scheduled to play at Mayville State in a conference doubleheader on Wednesday. Valley City State scored all four of its runs in the top of the third inning, including a three-run home run off the bat of freshman Sal Avila. Avila’s third home run of the season was all the offense the Vikings would need. Nicholas Vargas started and went seven innings on the mound, allowing just four hits and one run en route to his first win of the season. Christian Peery pitched two hitless innings to close out the game and earn the save. Vargas and Peery did not walk anyone and combined for 10 strikeouts, including seven by Vargas and three by Peery. Emmanuel Leyva went 3-for-5 and scored a run out of the leadoff position for VCSU. Grant Wehseler was 2-for-4 with a run and an RBI. Avila was 1-for-4 with his three-run home run. Viterbo’s Preston Gamroth took the loss, giving up six hits and four runs over six innings of work. Four different V-Hawks had one hit each. Neither team could push across a run in the series finale until Grant Wehseler stepped to the plate in the top of the ninth inning. Wehseler blasted a 2-1 pitch over the right-center field fence, putting the Vikings ahead 1-0 in extra innings. Brady Engebretson took it from there, striking out the side in the bottom of the ninth to complete the series sweep. Jesse Johnson and Engebretson were lights out on the mound for VCSU. Johnson started and went 6 1/3 innings, giving up just four hits and striking out nine batters in a no-decision. 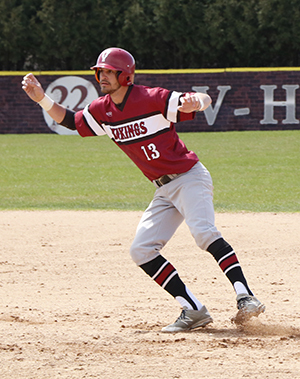 The game was scheduled for seven innings, and after Viterbo put the winning run on third base in the bottom of the seventh, the Vikings turned to Engebretson to work out of the jam. Engebretson hit the first batter he faced, but then came through with back-to-back strikeouts to send the game to extra innings. It was a sign of things to come for Engebretson, who struck out seven of the 10 batters he faced. The senior left-hander allowed just one hit over the final 2 2/3 innings, picking up his second victory of the season. VCSU had four hits in the game, including one each by Leyva, Wehseler, Brady Smith and Jayden Shipman. Viterbo’s Joe Cliver pitched a complete game in the loss, giving up four hits and a run while striking out six.